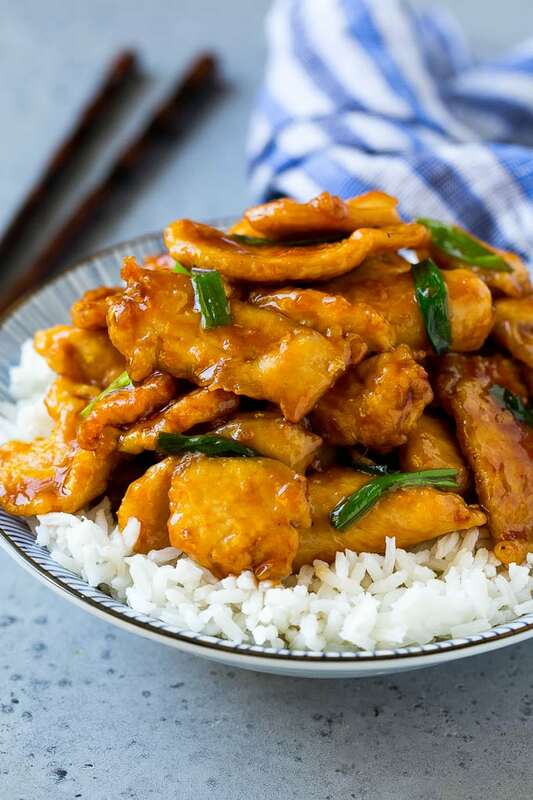 This Mongolian chicken is crispy slices of chicken breast stir fried in a sweet and savory sauce. A restaurant favorite that tastes even better when you make it at home! 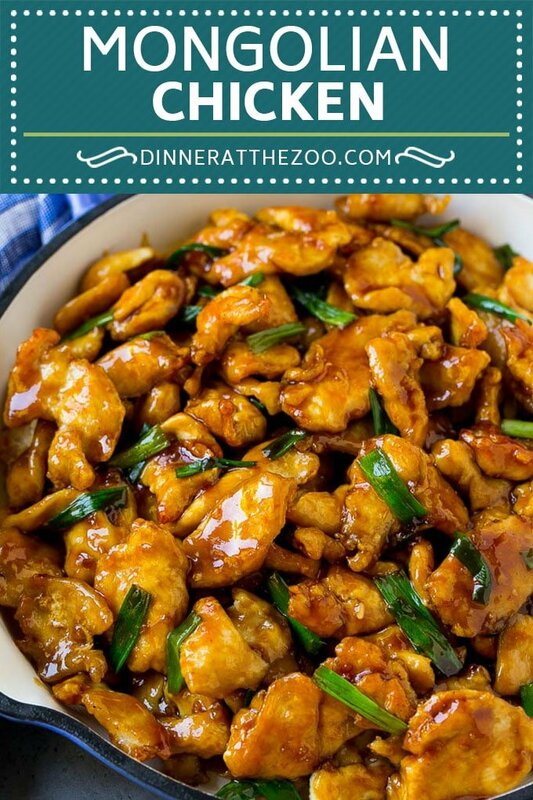 I’m a huge fan of Mongolian beef, but I have to say, I think I may like this easy Mongolian chicken even better. The chicken is perfectly crispy on the edges and the sauce has the perfect balance of flavors. I recently ordered Mongolian chicken at my local Chinese restaurant instead of my go-to Mongolian beef, and boy am I hooked. I decided I needed to learn how to make this dish at home, and it’s been on constant rotation in our house ever since. 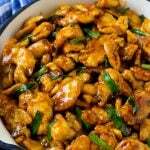 How do you make Mongolian chicken? 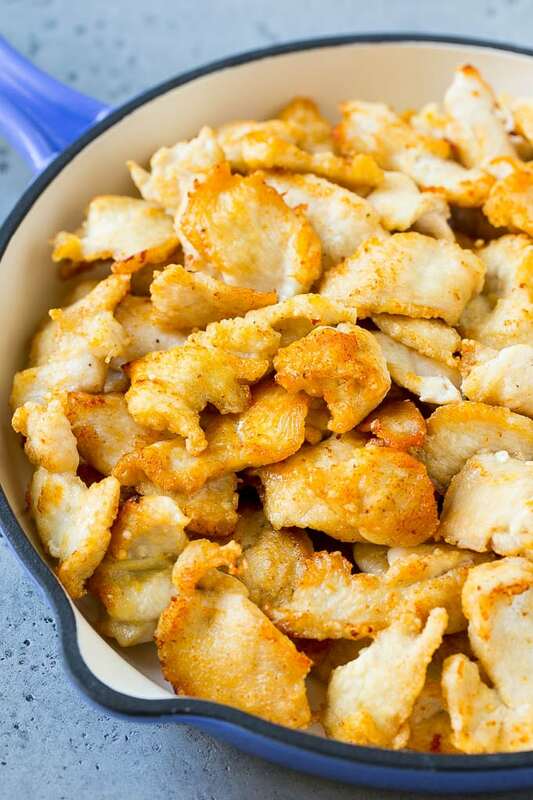 This recipe starts with thin pieces of chicken breast. I recommend partially freezing your chicken breasts to make them easier to slice. You can cube your chicken if that’s easier, but I think the long thin slices are better because they have more surface area for the sauce to cling to. The chicken is coated in cornstarch and stir fried until crispy. What is Mongolian sauce made of? 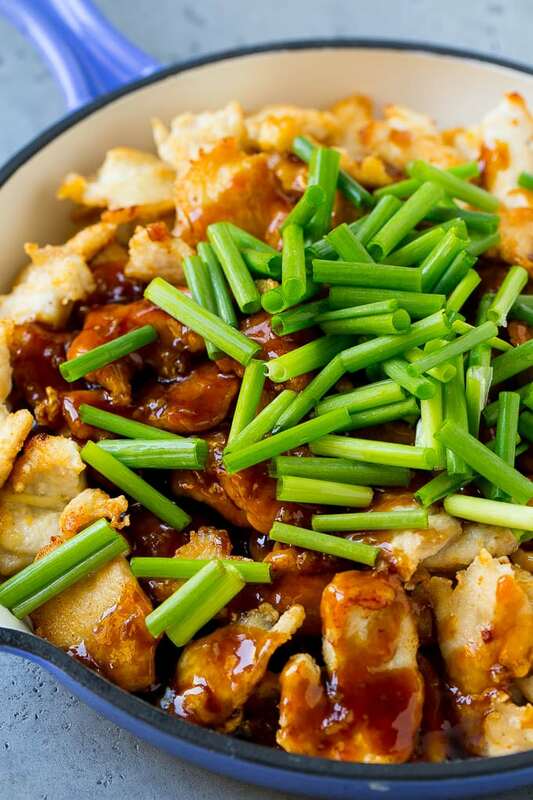 The crispy chicken pieces are coated in Mongolian sauce which is a combination of soy sauce, sesame oil and brown sugar. This dish also gets its flavor from the garlic, ginger and green onions that are added in during the cooking process. I typically serve Mongolian chicken over steamed rice, but it’s also great over zucchini noodles or cauliflower rice if you’re looking to watch your carbs. If you’re not watching your carbs, try it with a side of chow mein. If you’re not a fan of chicken breast, feel free to use chicken thighs in this dish. Or try something completely different and use shrimp instead of chicken, I’ve done that before and it’s fabulous. 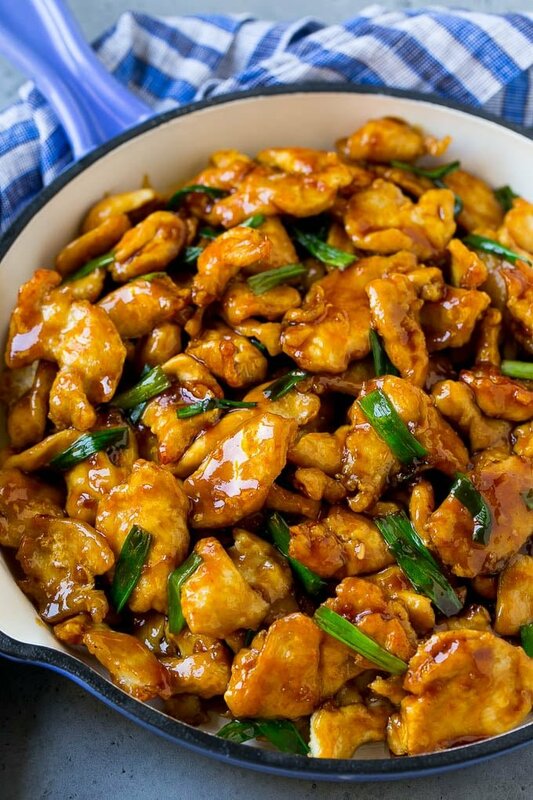 Regardless of how you choose to serve it, Mongolian chicken is sure to be a hit! My kids like it so much that they even ask to have it for lunch the next day. Place the chicken and 1/4 cup cornstarch in a resealable plastic bag, shake to coat evenly. Add the chicken to the pan in a single layer and season to taste with salt and pepper (keeping in mind the sauce has plenty of salt in it!). Cook for 3-4 minutes per side or until browned. Cook in multiple batches if needed. Add the garlic and ginger to the pan and cook for 30 seconds. Add the soy sauce, sesame oil, water and brown sugar to the pan and bring to a simmer. Mix the 2 teaspoons of cornstarch with 1 tablespoon of cold water. Add the cornstarch to the sauce and bring to a boil; boil for 30-60 seconds until just thickened. Add the chicken and green onions to the pan and toss to coat with the sauce. Serve over rice if desired. I love asian cuisine; this looks so delicious and worthy of a restaurant! Excited to make this over Spring break! Been looking for a good recipe for this for a long time and I finally found it! So good. Yum this was delicious! Thank you so much! THIS IS WHAT I AM TALKING ABOUT. BETTER than takeout to the max!!! One of my absolute favorites to order when we’re out for dinner. Can’t wait to make it at home! My husband and I had fun making this together! 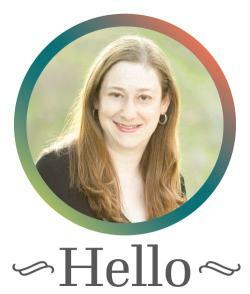 It was really quick and easy and way better than take out! This looks fabulous. I never had this type of chicken before but I will have to give it a go, I have a lot of chicken in my freezer. My kids get tired of chicken sometimes so I look for ways to keep it interesting. This would definitely do it. It’s like something you would get a restaurant at a fraction of the cost. OMG the flavors here are to die for! My family will devour this! This looks so easy and delicious! I love making Asian food at home. Your sauce looks amazing and I can’t wait to try this. Love it, very good flavor. Gets 5 ⭐ from our family! I have cooked this, minus the unnecessary sugar, & it is amazing like all recipes here. I wouldn’t call it ‘Mongolian’ though, where would ‘Mongols’ have got sugar from? Or corn? It seems more like the typical American-Chinese offering to me, the only difference that spring onions have been added after, instead of cooked in the beginning (or maybe they charge extra for those, using white onions to start with?). There is also no learning different techniques from using beef to using chicken, you just cook for a much shorter time. Beef, as in cattle, is not typically Mongolian either, they have Yak which is as different as Water Buffalo & Bison from ‘Cattle’, again another American ‘twist’ so use any meat (just for the record the most commonly used meat is mutton, something not found often in the U.S. who went for cattle farming more). Not a criticism, just an observation & also a compliment, I’m going to make it again at the weekend. (Mongolians generally thicken food with the ginger/garlic pastes or just don’t, they don’t have ‘plastic bags’ to put foreign flours in, like corn.